Happy Saturday! I got to sleep in today since it was so dark and overcast out -- yay! When I woke up this morning, the first thing I said after, "I can't believe how late it is" (it was 10:30)...was "I'm hungry". Hubby asked what I was hungry for...and the most bizarre word instantly came out of my mouth....SPROUTS, I said with lots of enthusiasm! LOL (Is that sick or what)? Anyway...I still had leftover Deep Dish Pizza Style Sprouts in the fridge from our dinner a couple of nights ago. I placed them in my ceramic non-stick skillet along with a little melted butter and covered them and began heating them up over medium heat. Once they began to sizzle a bit, I gently made a well in the center and cracked an egg into the well and covered my pan again and continued cooking until the egg was done. During the cooking/reheating process, the provolone that was originally melted on top of the sprouts gradually worked its way to the bottom where it developed a golden brown "crust" of sorts that held the sprouts together. This made it easy to literally just tip my skillet a bit and slide it off onto my plate. I seasoned it with additional cracked black pepper and enjoyed it thoroughly. 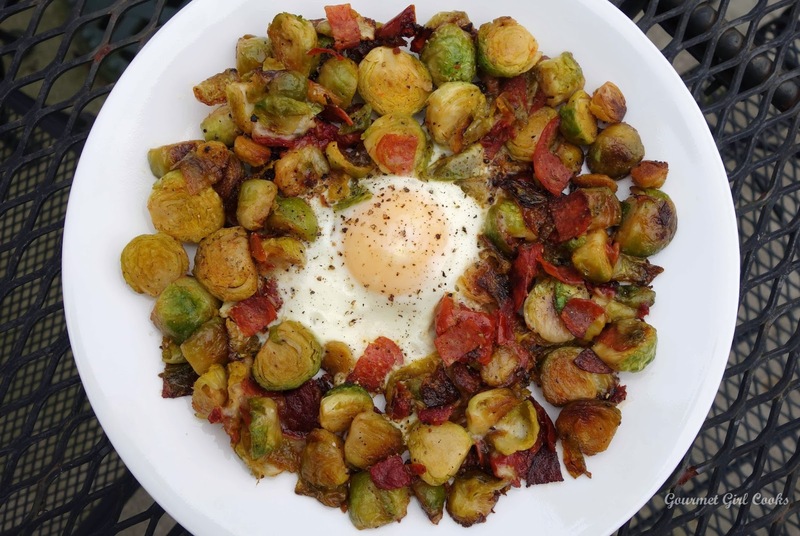 Even though I have made this type of breakfast before with sprouts and bacon...this one was especially tasty with the pepperoni, provolone and roasted tomatoes and the spicy hint from the spice infused olive oil I had drizzled on the sprouts when I made them the other night. The browned crusted cheese bottom was really good, too. I absolutely love making an entirely different meal out of what some (including my hubby) might consider just ho-hum leftovers. I snapped a quick picture below as a potential "breakfast idea" of how you can revitalize your leftovers regardless of how unusual it may seem. In case you didn't know already...I really loooooooooooove sprouts! Enjoy! GG, what would you do without Brussels sprouts? Do you buy Organic B.Sp.? Fresh or frozen. (Actually the frozen kind is fresher). From Costco? Costco sells white distilled vinegar in 2 pack of 1 gallon. Love reading about your creative uses for leftovers! What kind of ceramic skillet do you use? I need a new stir-fry type pan and think I'll go with ceramic, but am looking for a recommendation of a good brand.